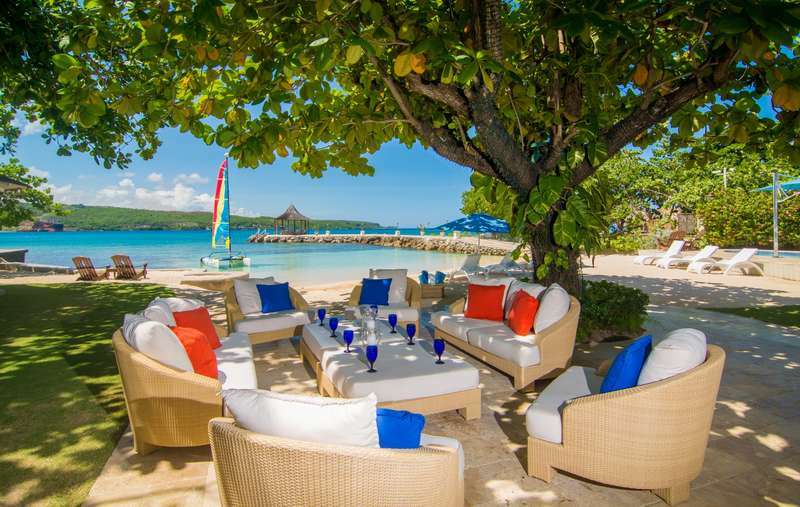 Situated in Saint Ann Parish, east of Montego Bay on the beautiful northern coast of Jamaica, Discovery Bay is loved for its green hills, clear turquoise waters, and perfect sand. Minibuses and route taxis are a common way of getting around this serene, quiet region of Jamaica, popular for its ability to renew even the weariest travellers. Driving time from Discovery Bay to Montego Bay is just over an hour, and Ocho Rios is only a 40-minute day trip away. Our Discovery Bay villa rentals may not be surrounded by nonstop action, but that is precisely why visitors love it so much. Spend your days enjoying the sun on your terrace or paddling the calm waters. Discovery Bay is relaxing, uncomplicated vacationing at its very best. Discovery Bay is also known by locals as Dry Harbour Bay because it sits beneath the area’s Dry Harbour Mountains. Discovery Bay was originally named Puerto Seco, or “dry harbour” by Christopher Columbus in 1494, reportedly because he could not find a source of fresh water in the region. In 1947 the town was renamed "Discovery Bay" as an acknowledgement of the town's history: it was believed that this was where Christopher Columbus first set foot on Jamaican soil. However, this claim has been passionately contested, as two other towns also claim to be Columbus's first landing point. One thing’s for sure, the entire region is rich with history, and this is evident in the area’s popular attractions. Columbus Park in Discovery Bay is located at the exact place where Christopher Columbus is said to have arrived. Visitors can view artifacts from the era in Columbus Park’s open-air roadside museum located atop a bluff on the west side of the Bay. The park features anchors, cannons, nautical bells, sugar-boiling coppers and an old waterwheel, as well as a locomotive once used to haul sugar. Close by can be found the remains of Quadrant Wharf, built by the British in 1777, complete with a mural that acknowledges Columbus’ landing. There are several places to stop and order a helping of tasty jerk here, which makes it a popular stop for tour coaches. Visitors to the Green Grotto Caves can explore remnants of the native Taíno Arawak lifestyle. Numerous Spaniards are said to have escaped the English invasion of 1655 through secret passages in these caves, with the help of Arawaks and African slaves, in exchange for their freedom. Kids will love visiting this series of underground caverns with their impressive, intricately formed stalactites and stalagmites. Green Grotto is over 5000 feet long and close to 40 feet deep and is characterized by a variety of chambers, light holes, and a subterranean lake. Situated on 64 acres of Jamaica’s beautiful north coast, the Caves are located 2 miles from Discovery Bay to the west and 2.5 miles from Runaway Bay to the east. The Kaiser Bauxite processing plant, located on the inland side of the road, is home to the annual "Pushcart Derby" where fearless contestants race pushcarts down a steep hill. The derby was featured in and made famous by the well-known 1993 movie "Cool Runnings,” which tells a fictionalized account of the true story of Jamaica’s participation in the bobsledding event at the 1988 winter Olympics in Calgary. Puerto Seco Beach, located on the east side of the bay, is beloved for its family-friendly energy and convenient water sports rentals. The large white sand beach is very popular with residents on weekends, as well as with tourists staying in nearby Discovery Bay vacation rentals during the week. The private beach has a range of modern amenities, including changing facilities, toilets, showers, lifeguards, a beach bar and snack shop, and charming gazeboes. There is also a children’s playground, complete with slides and swings. Our Discovery Bay villas are pristine and exquisite. Makana is one of the most glamorous Discovery Bay luxury rentals of all. This spacious villa boasts a private tennis court and swimming pool on a fine white sand beach that borders sparkling waters perfect for swimming and kayaking. Home cooked meals are served on a terrace overlooking the lawn, garden, private pool, beach, and breathtaking blue bay. The welcoming Sea Grapes luxury villa rental is your home away from home. The tennis court, white sand beach, and bountiful blue waters are the perfect place to unwind. Linga-Awile is a casual cottage sharing a glorious waterfront site with its sister property, Coral Cove Villa. Beyond the lawn and swimming pool - you guessed it, white sand beach. If one group rents both Discovery Bay villas, all may dine together! Throughout Jamaica, tipping protocols differ slightly from place to place. Some restaurants include a 10-15% gratuities fee on your final bill, while others do not. Check your bill or ask your server to explain any charges incurred. If a gratuities fee was not charged, tip 10-18%, much as you would at home. Do not confuse the gratuity charge with a 10% service charge that some restaurants add to your bill, as the latter does not go to your servers. A 10-15% tip for taxi drivers is customary and very appreciated.